Every year at Christmas, Chester Zoo invites everyone to join them on an magical nighttime journey. The route through the darkness is lit by beautiful animal lanterns and spectacular scenes which, when taken together, tell a captivating story. Like all of Chester Zoo’s work, this is an innovative and world class event. The zoo have asked us to work on The Lanterns festive event for a couple of years and in 2017, they wanted our help in bringing to life a story that tied together the magic of children’s festive wishes and the zoo’s incredibly important conservation work. Winter is traditionally a quiet period for zoos but at Chester, The Lanterns has dramatically changed that. Each year thousands of people brave the cold to experience a touch of festive magic. After all, when else do you have the chance to visit the zoo after dark? Our brief was to attract more people than ever before, whilst still appealing to the previous visitors who loved it so much. In 2017, The Lanterns event was slightly different from previous years as it became a more theatrical experience. In addition to the magnificent lanterns themselves, there was also outstanding performances by aerial acrobats, musicians and roller skaters. As part of this change, there was a stronger storyline throughout The Lanterns journey for the audience to engage with and follow as they walked around. At first they thought that the journey was simple, with presents piled high and the postal workers rushing to answer all of the letters to Santa, making sure that every child got just what they wished for. Then they saw that this magical world is full of real animals from all over the world. Animals that inspire us to stop, to look and to wonder what they would wish for Christmas. Because there is a little bit of magic in every animal at the zoo. The lantern route was filled to the brim with sacks of lantern toys, boxes of lantern presents, and huge postboxes for children and families to post their own letters. Our creative campaign needed to reflect the wonder, magic and excitement created by each animal character. Whatever direction we chose to take with the creative campaign, it was crucial that it still remained recognisably Chester Zoo. We needed to link The Lanterns story with the Chester Zoo brand values, inspiring people about the natural world and engendering a spirit of playfulness. As with every Chester Zoo creative campaign, it was important that we considered their target audiences from families with children to couples looking for a special evening out, ensuring that they would all be excited by the idea of spending a magical evening at the zoo. Amongst all the festive fun, we needed to show how animals are threatened and what they need not just to survive, but thrive. The Lanterns event is designed for a wide range of people and our creative had to engage and excite them all. Our short animation had to give the audience a taste of what to expect at The Lanterns, including the Christmas letter story at its heart. The visual we created for The Lanterns at Chester Zoo had a wonderful narrative and truly told the story of the event, whilst retaining the theme around the magical Christmas sorting office. Inspiration was taken from traditional and modern stories, such as Narnia, to create beautiful storybook-style illustrations. The night time scenes brought magic and drama, as well as indicating the breathtaking scale of the event. Whether you’re a child or a nostalgic adult, the creative was designed to inspire and excite, with the promise of an event that will take you on a “Spellbinding Theatrical Adventure”. All of the animal graphics were designed based on the areas around the event. For example, the ‘Flamingo Lounge’ had roller skaters dressed as a flamingos moving between the flamingo lanterns. 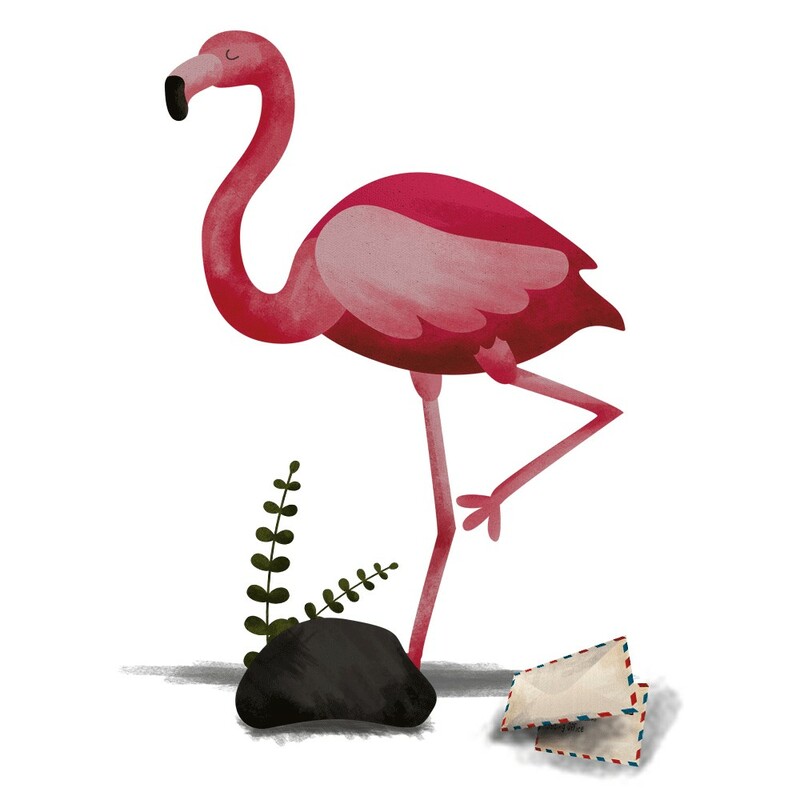 The scene we created beautifully represented this, complete with a flamingo with a personality all of its own! Other areas we focussed on included the ‘Spectacled Bear Airship’, ‘Hyacinth Macaw’s Nutcracker Suite’, ‘Spider’s Web of Light’, and the ‘Silvery Gibbon’. At every stage we made sure we avoided the personification of any animals. Our creative ensured the animals displayed natural behaviour. This was particularly important when it came to crafting the rhyme voiceover for the animation. By being careful and precise with the language we used, we were able to convey the magical spirit of the event without compromising Chester Zoo’s values. In fact, we were even able to weave in a series of important conservation messages! For example, ‘The flamingos wanted warmth and space to roam. Water clean and shallow to safely call home’.